We have all been touched by an Angel…whether we know it or not…a protective, reassuring touch as light as a feather. 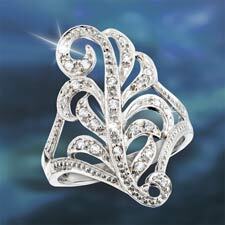 The graceful flowing curves of this feather motif ring are simply exquisite with 24 brilliant White Topaz accents. Award-winning Jewelry Designer Marjorie Andes has created this sentimental ring in Sterling Silver to offer daily assurance of God’s love. Size 10 is no longer available.